Jim Carrey, “Destroyer” Photo courtesy of Jim Carrey. 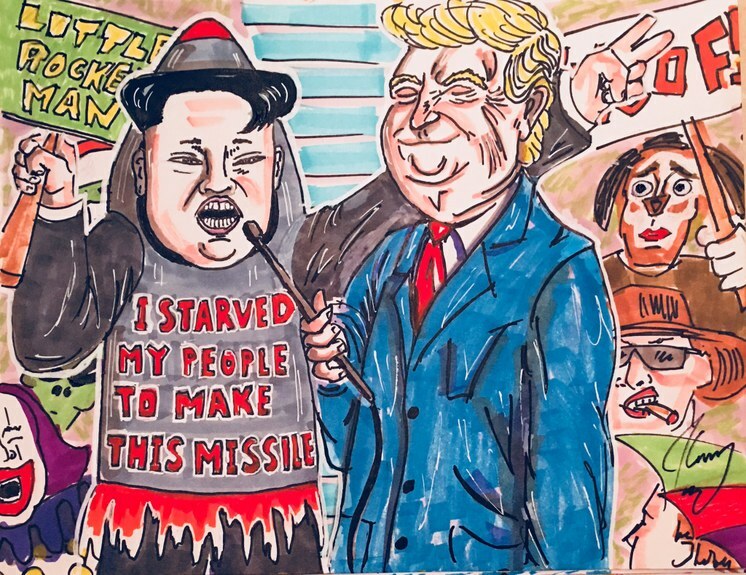 Then the Trump administration enraged him so much that in 2016 he started painting and drawing cartoons of the president and his allies and posting them on Twitter, with witty, angry captions. Now a collection of more than 100 of those images have been framed and put on display at Maccarone Gallery in Boyle Heights, in a show called IndigNATION: Political Drawings by Jim Carrey, 2016-2018. 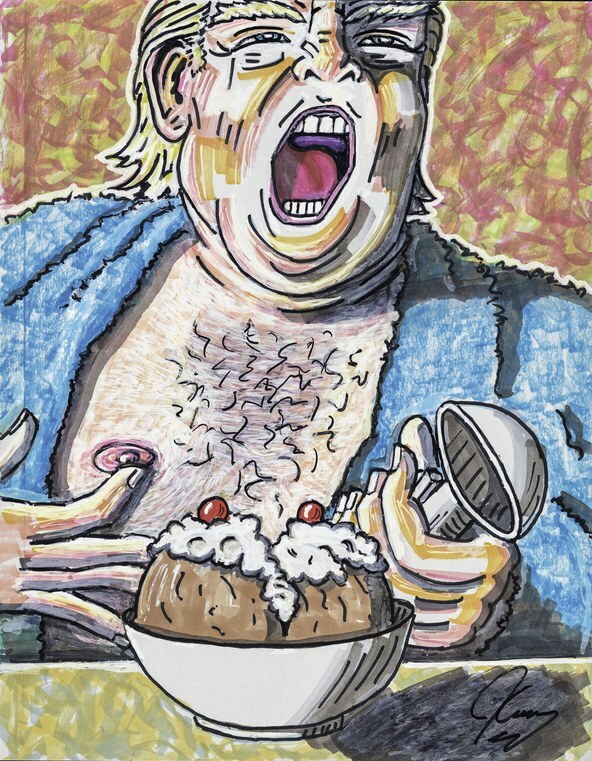 Jim Carrey talks to DnA about what drove him to take up political cartooning and why even people who can’t draw should take up art. Carrey got a start in visual art while a child in Canada, drawing with his mother on a train. Even then he was a performer, and showed them off to other passengers. He tells DnA that finding expression for feelings is what matters, whether through a performance on stage or a line on paper. 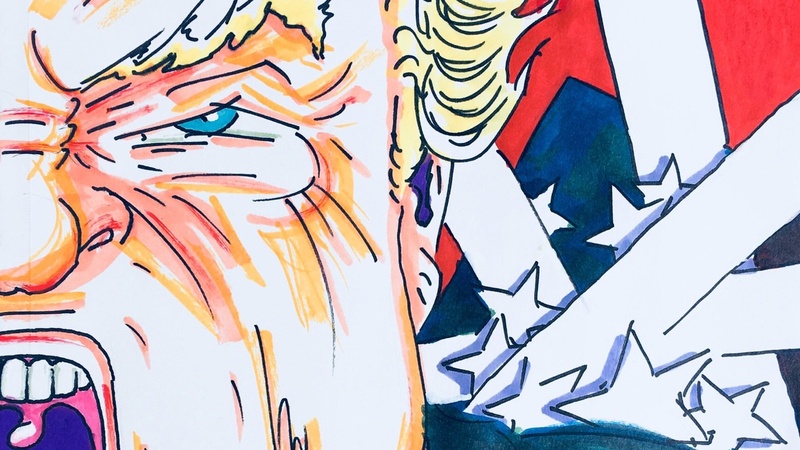 The political landscape has shifted since the midterms, but the president’s love of divisive rhetoric appears undimmed, and so Carrey is still busy drawing. The more than 100 images on show at Maccarone show a range of artistic skill, from somewhat crude to more complex. But they burst with urgancy and “indignation” and he has a knack for capturing likenesses -- of Trump, Putin, Giuliani and many other characters on the current stage. 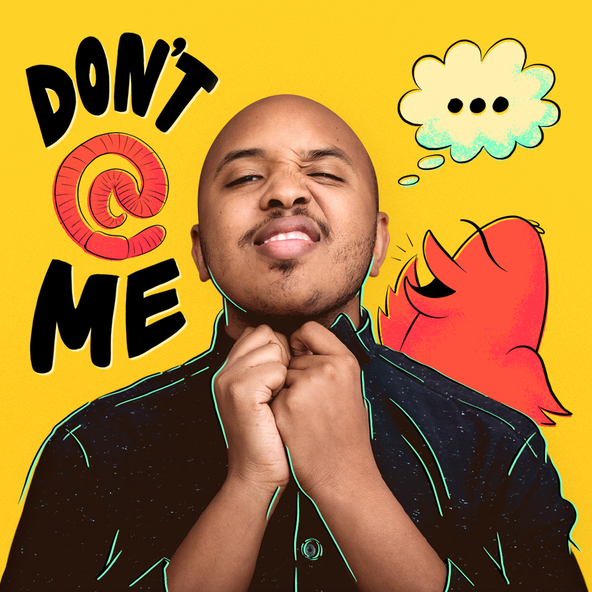 “When I look at the show, I see the beginnings and I go ‘wow.’ It was rather crude right out of the gate and I've slowly started turning into an actual cartoonist,” he said. And would Carrey like some attention from Trump, in the form of a lawsuit or an eviscerating tweet? “No. I'd like him to leave. I'd like him to hand over the keys to Mar-a-Lago and the Trump Tower to the Feds and I'd like him to just disappear, just go away,” he said. Now of course a question comes up in connection with this show: would Maccarone gallery owner Michele Maccarone have been attracted to these images if they weren't by Jim Carrey? She says she shared his fury at the Trump administration. But if an unknown artist had submitted them to the gallery, would she have even given them consideration? “I wouldn't have seen them unless they were on Twitter. And the reason why they were so visible on Twitter is because he's a celebrity. So it goes hand in hand. And I just felt that there was such an obsession and fury to it,” she said. Maccarone says the Carrey show has drawn a whole new audience to her gallery, one that’s not necessarily tied to the art world. “I think there are people that are really curious. I think everyone that comes in wants to talk. They want to talk about their feelings. They want to talk about how they feel about what's happening in politics and with the government and with our president and I'm really engaged,” she said. Her trademark shows to date had been in her words, “rigorous, conceptual, contemporary, sometimes political, sometimes formal, sometimes groundbreaking.” But recently the Barnard-trained art historian and gallerist has been rethinking her artistic values.